Michael Stoebner is an artist whose designs I translate into handpainted needlepoint. He’s a very talented designer, licensing his designs to Department 56 (recognize that name?) amongst others including yours truly. We have recently stitched two of Michael’s halloween canvases, Witch Services and Happy Halloween. 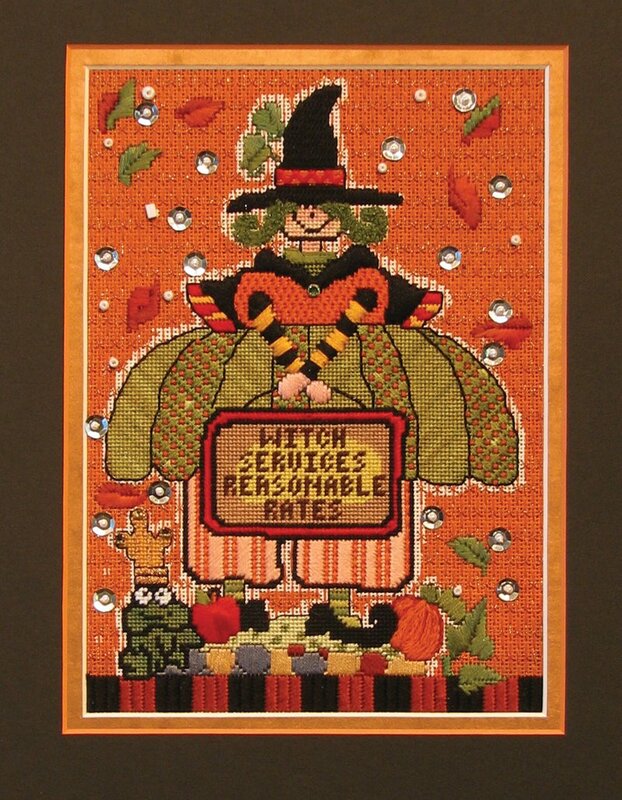 Michele stitched Witch Services and really downplayed Michael’s signature black outlines. She is so cute. Love the crazy sequins in the background. We used lots of fabulous overdyes to bring her to life but simplify the shading. The background is a great openwork pattern. Long laid stitches tacked down with Cross Stitches. How easy is that. More Halloween later. But first I have to see if our little witch has a magic potion for faster stitching. « Previous: Can we say O C D?